Recently with the bad weather in the UK, I have been dreaming of sunnier climes. Doesn't the weather get you down when it's constant rain and wind? Well this week we have had sun! It's been great to see and hopefully this will be the start of a lovely spring. I am glad to see the sun as I was sent some Maui Jim sunglasses to review. Maui Jim is a premium sunglass company based in Lahaina Hawaii. Now the fastest growing premium polarised sunglass maker in the world, they saw a gap in the market for a brand that could combat intense glare and harmful UV while bringing the brilliant colours of the island to life. From this brand research, they created the revolutionary PolarizedPlus® lens - this colour-enhancing treatment to the lenses made with earth elements really make colours bright and vibrant. Every detail they say is crisper and cleaner without glare or harmful U.V. light. Of course that's really important as UV radiation, whether from natural sunlight or artificial UV rays, can damage the eye's surface tissues as well as the cornea and lens. Their PolarizedPlus®2 lens wipe out 100% of harmful UV light. So I was given a chance to review a pair of their sunglasses. It was a hard decision which style to choose as there are lots of cool and stylish designs on their website. I decided eventually on the Maile design. These sunglasses have an old-school glamour of yesteryear. Think Hollywood starlet, sightseeing in Rome or cocktails by the pool. I choose the black frames as I thought they would go with most things, and are suitably understated but still stylish. These sunglasses feature Maui Jim's newest and most advanced lenses, MauiPure™. Proprietary and exclusively found in Maui Jim sunglasses, MauiPure is the world's clearest non-glass lens material and has the added benefits of being ultra-light and extremely scratch- and impact-resistant. I think they look feminine and beautiful whilst still providing the utmost protection for the eyes. I was sceptical about the difference in colours but I did think colours looked enhanced and more vibrant. The gradient coating means it is darker at the top of the lens and slightly lighter at the bottom. They also have anti-corrosive springs and coating so perfect for that LA holiday, the beaches of West Wales or you could even get splashed by the Trevi Fountain and they would still be perfect! Maui Jim sunglasses are available from all good opticians and stockists including Optical Express and The Optic Shop. You can even buy them in your own prescription too. For more information, visit MauiJim.com. What do you think of the brand and the design I have chosen? Do you have any favourites from their website? Let me know! Aw I am sure you don't. They have loads of styles though I am sure there is something to suit you on the website. We certainly deserve some sunshine in the UK! These look divine! I really need to get myself a pair - don't own as single set of sunglasses, as they've all been broken by the children! Thanks really pleased with them, they feel like they are great quality too. They look cool on you, I love a pair of good sunglasses, especially during the hot, bright holidays in Greece! Let's hope the weather improves now it is Spring in the UK. Some lovely sunglasses there, I've actually had to wear my sunglasses a couple of times this week so fingers crossed it continues! Lets hope, at least no sign on snow in March for once! I love big sunglasses like this, you look great. I look ridiculous in big glasses...not fair! I am sure you do not lol. Yes they have a good filtering system it shows what type of face certain sunglasses suit. They are super sunglasses Kirsty I must admit. Those glasses look amazing. That reminds me I need some before the sun starts shining! The perfect time to buy some then. I agree with Angela - those really suit you! I love big glasses like these I think they suit my face, it reminds me of old school glam. Cool sunnies, fingers crossed from some sunshine soon! I am hoping we will have a gorgeous spring. Awe thank you Caroline, that is really sweet of you to say so. It is lovely when the nicer weather starts arriving isn't it. Fab choice of sunglasses! Thank you, and yes it is lovely when the weather starts to improve. I think they are important to protect your eyes as well as look stylish. Maybe give them a go this year Lisa. I think they are great quality sunglasses. Well as well as looking stylish they do protect your eyes from UV light which is very important. 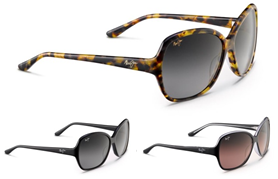 Why don't you have a look at the Maui Jim website Kara, they do have lots of different styles. You look great :) I don't wear sunglasses very often, I just never think about buying any! I love sunglasses, I feel it's important to protect my eyes, especially in the height of summer. They look fantastic. I am so longing for the weather to wear sunglasses. Love that tortoiseshell pair, very old Hollywood. Thank you! Yes they look chic Hollywood. I wear contacts but I think these glasses come in prescription too. Its getting to that time of year again when I need to splash out on new sunnies! This review was really useful and informative. I love the styles and will definitely be looking into having myself some!